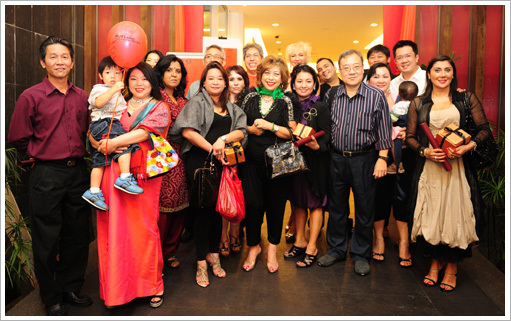 Once again Lillian Too’s ever-popular back to back two weeks Master Practitioner’s Course series on Paht Chee & Feng Shui brought students from all around the world to the magical city of Kuala Lumpur. This time, students from Australia, Canada, India, Indonesia, Lebonan, Macau, Malaysia, Nigeria, Philippines, Serbia, Singapore, UAE, UK and the USA spent a glorious week with Lillian, learning the secrets of paht chee and feng shui. Many were learning feng shui for the first time as a result of which they found the course structure extremely conducive to learning. The one-week intensive course covered all the complex nuances of analyzing fundamental environmental feng shui as well as learning up on the different techniques and formulas needed to analyze the feng shui of SPACE thoroughly. Basically all the Landscape, Form Scool, Pa Kua, 8 Mansions, Flying Star formulas were covered and time was spent also on revising the Trigrams from the I-Ching as well as the Astrology and feng shyui wheel of time. All daily lectures are personally taught by Lillian in the mornings while afternoon sessions comprise tutorials and practical site visits to different kinds of homes. Visits were made to three different types of residences that included a link house, an apartment and a bungalow. This gave students good practical experience in taking compass readings from a Luo Pan and assessing visual feng shui first hand. This basically is the Case method which Lillian uses to great effect as tutorial sessions after the site visits and it serves as a sounding board for later discussions and also to clarify students' doubts. As a learning experience this is fun and also very effective as students tend to remember practical work much better. This is one reason why many prefer personally learning face to face with Lillian. For the first time in years, the number of men who attended was equal to the number of women who enrolled, bringing a very serious and analytical dynamic to the class! For the “course exam” case study, students were taken to a Link House and asked to work in groups of five to provide their best collective recommendations on how its feng shui can be improved. Group work encouraged open discussion, balanced debate and peer-bonding, which was evident in the quality of case studies submitted by all groups. 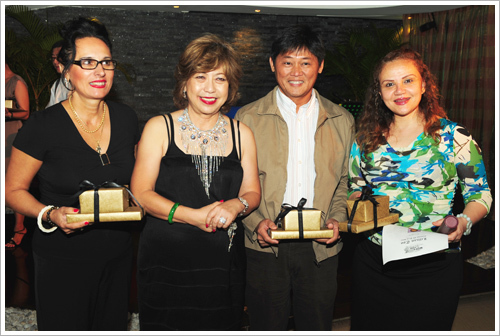 On the final day, the graduation ceremony was held at the elegant Bossanova Supper Club in the heart of Kuala Lumpur. Students wined and dined to a superb buffet of roasts and salads, and danced the night away to a live band who entertained us with numbers new and old. Students received their Certificates before cheering on the winners of the Case Study exam. 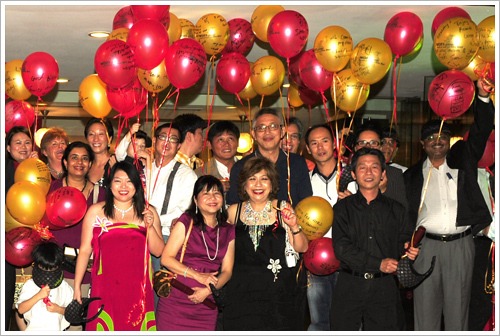 The night ended with the wish fulfilling balloon ritual celebration. Everyone wrote their wishes on helium filled balloons and then released them altogether to the Sky Dragons and Moon Goddess. I like the combination of theory & hands on revisions! This course is very much crucial to the practice of Feng Shui, as gives more insight to feng shui. Lillian is easily approachable and direct, I love her willingness to share knowledge. I am impressed with Ms. Connie professional approach right from email interactions in providing assistance and Mr Stanley agreement to share knowledge and his efforts . All staff of wofs professional approach which made our sessions comfortable. Coffee serving staff ever smily. It is very inspirational, great energy! I will definitely recommend this course to my friends! It is fantastic tuition and grounding to the practice of Feng Shui. Lillian is Infections! Great passion & energy! Thanks you for everything! This course is very crucial as this is the stepping stone to better Feng Shui! Lillian is so full of energy, vibrant & lifely! I fell she has transferred such good aura to me. I fell great after the course. Lillian has imparted to me compassion, love and forgiveness! I love the the vibrant that Lillian gave in class, her energy and motivation given to have a good life as well as patience of Stanley! This course is very important in order to get the correct good Feng Shui. I appreciate the valuable information and tips as well as awareness on common mistakes we might encounter. Lillian is a very charismatic and optimistic personality! I enjoy the method of teaching! Lillian makes it all look so easy. She is Amazing. Her passion for the subject , her vibrance , dynamismen, enthusiasm makes it all worth while. Thank you so much madam Lillian. Thank you so much for giving us the opportunity to be part of the MPC course. Thank you Stanley for all the revision classes which made it easier. Thank you Connie for all the help in making our stay comfortable and patiently answering all our queries on email. May good bless you all. All the subjects taught are fantastic! Beside the course subject Lillian also shares with us so many secrets that we can’t get from her books. I like all the topics covered in this class! This course is very essential, every one must attend the practitioners course! 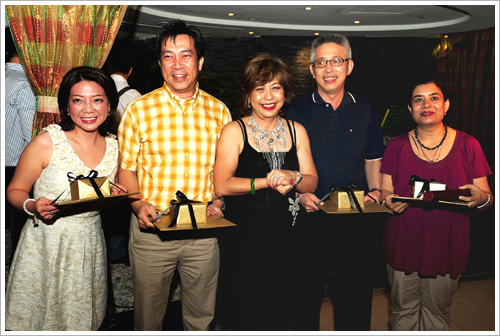 I wish to extend my heartfelt appreciation to all the staff and my lovely and vibrant “Si Fu” Lillian. May god bless her and wish that she will at pink of health forever, because she is a person cannot be missed. This course is empowering ourself to take actions for better life! I will definitely recommend this to my friends! Definitely I like the subject taught in class, it is so fascinating! I just like it the way it was presented, I like it just the way it is, I won’t change a thing! I really enjoy this course! Lillian is very energetic. I like her most because she is very approachable and we can share and learn on our problems. I am very happy also because she is my secret friend. Her approach is very good. I’ll take this course to improve my life better and help other people’s live. Thanks Lillian and have a great time with you! I like the course very much, I think that it is a fascinating world which enter the more you learn, more you like to know and discovering new things at the same times answering some of the many question why experience or things that give lived and they are living to day both personally and globally. Lillian transmitted her energy in a simple, easy way and she guide us in a safely and directly to each subject taught. The subjects taught are excellent although may not be the entire depth but definitely is adequate, interesting and well delivered to meet learner’s requirement at this stage. Scopes of subjects well structured. It is excellent, I will surely recommend this course to friends! Lillian’s approach is great! It is the way 21st century technique and learning approach is. Experiential sharing, scenario based, problem based, teaching and learning approaches, mostly important for me as learner. We are taught to fish and not just provided with fish – learner will have great foundation. Appreciated and thankful to the entire WOFS office staff here, they are always helpful , cheerful. Lecturers and facilitators are great - always ready to share and make learners understand, great humor was also included in learning that enhanced learning experience, cheers to all WOFS staff and Grand Master Lillian Too! 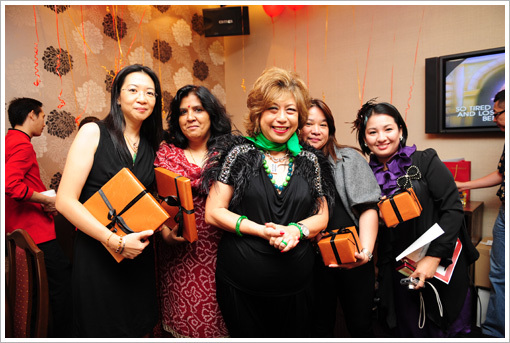 Following upon the MPC was Lillian's only Paht chee class for the year and for many in the class, this was their third or fourth time coming to Kuala Lumpur to learn from her. so there were a great many old friends as well asa couple of new students. Once again the class was very cosmopolitan com prising a mixed group form nine countries. Paht Chee is Chinese destiny analysis based on a person's four Pillars of birth time details- the Hour, Day, Month and Year. Lillian and her students had great fun together reading and interpreting the charts of major celebrities and international personalities, with Lillian and her team - Phillip Lim and Stanley - taking them into deeper and deeper methods of analysis. Paht Chee destiny reading is a very popular and important branch of a person's overall feng shui. Destiny luck is the fate that one is born with, the heaven luck often alluded to in the trinity of luck - tien ti ren - but destiny luck is not something that cannot be changed or transformed. indeed one of the ebst reasons for learning how to create, read and interpret one's Paht Chee chart is to discover - through reading the charts - all the factors that oinfluence one's luck at any moment in time, a year, a time period … and to then create an environment where favourable elements and symbols needed to transform any form of bad luck in the chart, into good fortune. THIS IS THE MAJOR RAISON D'ETRE the vital reason for learning Paht Chee. Lillian hence spent a good deal of time teaching not only analysis of Paht Chee but also what one can do to overcome periods of bad luck. And because she is also very knowledgeable about spiritual amulets and talismans, many were the times when in coming across certain afflictions in the chart of students whose charts were being read were given some specific amulets and rituals to overcome their respective bad luck period. I like the way it was being taught, it is easy to understand! This strengthen my knowledge of feng shui, a bonus to me if I really need to practice. I like the subjects taught very much, it is very interesting and powerful! Lillian is very-very powerful, understanding, very funny, happy and touching. I’m happy that I have a chance to come here and to meet MS.Lillian Too. I’m so proud to be her student. Thank you very much to all of you…and may you have more blessing to come. Thanks god that I meet you all. Learning Paht Chee is crucial to the practice of Feng Shui as it is related to each other. As usual, Lillian’s charismatic style of teaching and the “you must know the basic” to start with. The course is slightly different from the MPC and MCC. We have Philip as the trainer for this course. 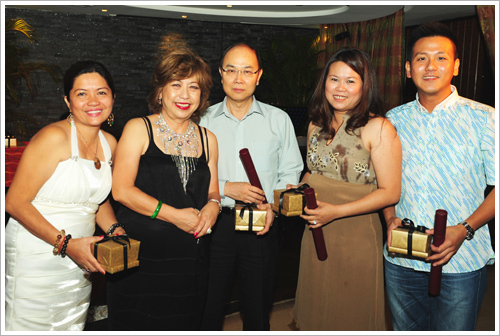 His vast experience in Paht Chee course give a better in-sight in the teaching. His sharing and the disclosure of the practical aspects of Paht Chee was good. He thought us “down” to the basic level and his patience in the explaining and elaboration was commendable. I love everything about the course! Serious Feng Shui practitioner must attend this course, it’s very crucial. Lillian is Awesome! She makes a complicated subject uncomplicated. Paht Chee is the frosting of Feng Shui. Paht Chee is extremely crucial when analyzing the Feng Shui of a customer. Phillip did a great job, keep on teaching. In my personal experience Path Chee has been the missing piece of my house Feng Shui. I see instant results. I like the way everything was explained. It is very important to the practice of Feng Shui. Lillian is knowledgeable, she make it so easy and simple to understand! I left comfortable. This is my second course which I’ve done from Lillian Too. It was very beneficial to do it. I’ll be coming again to learn everything personally from her. The course was very interesting and many things become more clear. Lillian’s approach towards us was also very easy going, friendly and full of warmth. I learn a lot from her and I am sure when I’ll apply this in my life I am going to gain a lot! Thank you! This course compliments Feng Shui. I enjoy meeting people from all over the world here. I like it very much! I love the way of Lillian teaching, it become so easy, she is great!!! Best teacher!! Phillip revision class was very nice. Knowledge in Paht Chee will help a lot in my feng shui consultations to be more accurate. It was a great experience you guys made it so easy and enjoyable. Thank you. It is very interesting and energizing for me. Very interactive! It is important and essential to the practice of Feng Shui, both subjects are actually inter-related in a way.